Project obstacles and solutions: The Indiana American Water Treatment Plant needed to replace a 1 million gallon processing tank that had been built in 1906. The new facility included a 1.25 million gallon clearwell and pumping station. River City Construction was selected as the contractor for this project. The original specifications called for the walls of the facility to be coated with a waterproofing pitch. IMI QC/QA suggested that using a crystalline admixture would create a longer lasting water resistant concrete and save money. This changes the chemistry of the concrete to fill in its pores. When used as an admixture, it pervades the entire depth of the concrete, making the entire slab waterproof. This provides better performance for concrete where water resistance is key to the construction. River City and the engineers for Indiana American asked IMI to design a mix that would take into consideration several factors, including heat during the hydration process, slowly building strength in the concrete, and shrinkage. The mix also had to have a low cement-to-water ratio to reduce permeability. When there is excessive bleed water in concrete, the escaping water creates additional pores and micro-cracks in concrete, leaving gaps for water seepage. Low cement-to-water ratios reduce these gaps. The concrete for the exterior walls were mixed with a crystalline admixture. The floor of the facility was finished as an 11 hour continuous pour. IMI supplied 2,100 yards of concrete at up to 200 yards per hour during that pour. In all, IMI supplied 4,900 yards for the facility. The customer saved $80,000 in additional material and labor by using the crystalline admixture. 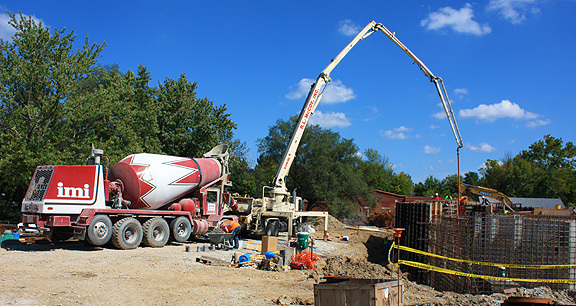 In 2016, this project won an Outstanding Concrete Achievement Award from the Indiana Ready Mix Concrete Association for Infrastructure - Water Plant Projects.